I really want a dog. Properly, desperately and, in the proclamations of Mr Darcy, ardently dream of dog ownership, but until I’m in a position to have one, I must live vicariously through instagram stories, tweets and cuddles of other people’s pooches, and of course gorgeous picture books like this one, 100 Dogs, written and illustrated by Michael Whaite and published by Penguin Random House. I firstly would like to state that I am aware of some of the upset surrounding this book and its representation of certain dog breeds. I understand that owners may feel upset at the contents of the book, but I advise anyone reading ANY children’s picture book to use it as an initial discussion point about the contents. I do not believe in censorship and I most certainly do not endorse any kind of hate mob, which is not showing the (lovely) breed of dog in question in any better a light. I stand by my review, I love this book, I love AlL dogs and I let you make your own mind up. 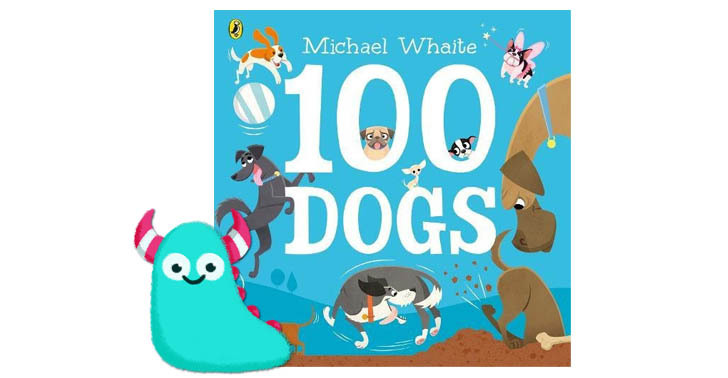 In 100 Dogs Michael Whaite takes us on a journey through every dog you can possibly imagine, it’s an absolute joy for me if I’m completely honest. We have every breed of dog, every situation and every emotion covered here and there really are 100 dogs in this book. I counted them all. Well I actually counted 101, but that’s a potential clerical error on my part! Michael’s illustrations in this fabulous book are truly joyous! He’s captured every single breed of dog, pedigree and mixed with all their unique looks, my particular favourite being the muddy springer spaniel with his eager “ready to go again boss” look! Alongside the dogs are little details to give that all important re-readability factor and added interest. The expression on the dogs faces will help children start to recognise emotions and different feelings, an important very first step in empathy and emotional intelligence. This is clearly a man who knows his dogs and has thoroughly enjoyed every moment of illustrating them. I love that. The illustrations are spectacularly adorable, but, another stand out aspect of this picture book is the writing style. 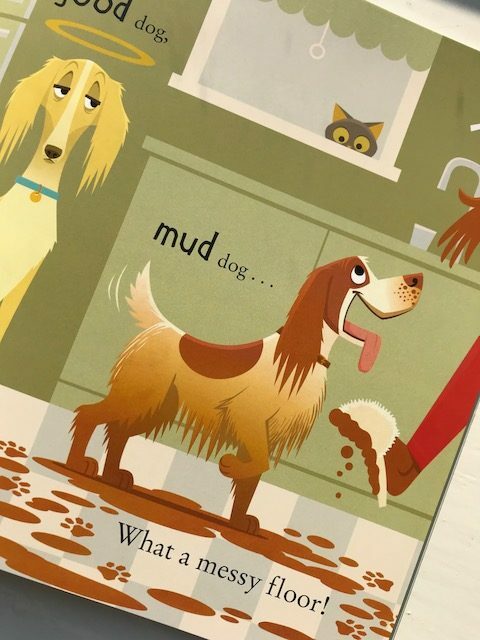 I recently watched a most glorious instagram story by my blogger friend Bookbairn (do visit her blog http://www.bookbairn.com) showing her little girl read this book out loud so brilliantly and it absolutely summed it up for me. This is a fun sing-song, rhythmic and entertaining journey. 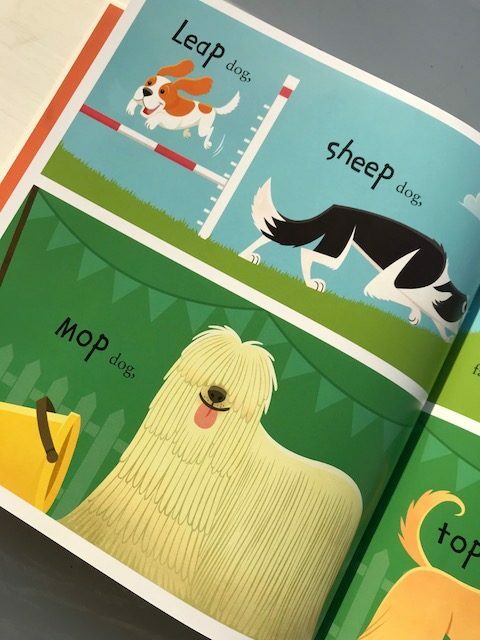 It’s a great story for young children to kick start their reading skills, containing short sharp song-like sentences and illustrations which give context and help support children when they struggle with a word or two. Clever and well thought out book right here. 100 Dogs is just a hugely enjoyable celebration of dogs and all that we love about them. I’ve read this, I intend to read it again for my next storytime session, and yes, I do still, very much, want a dog! 100 Dogs is now available from all good book shops and libraries. Thank you Penguin for sending me a copy of 100 Dogs and thank you for reading this unleashed Book Monsters review.